The Louisville Courier-Journal is considered the foremost newspaper in the United States when it comes to the Kentucky Derby, which of course is held at Churchill Downs in the city. And in the Courier-Journal’s first national Derby poll of the year in late January, Cairo Prince was given the No. 2 ranking and listed as a Kentucky Derby betting favorite, just behind Honor Code. That poll often influences how people bet on the Kentucky Derby. Cairo Prince has made four career starts with three wins and a second. 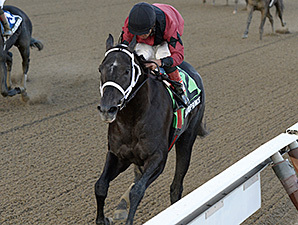 The latter finish was at the Grade 2 Remsen at Aqueduct, edged by Honor Code. Trained by Kiaran McLaughlin, Cairo Prince broke his maiden with a 2 3/4-length win at Belmont Park in October 2013 as the 2-1 second betting choice on horse racing odds. Cairo Prince covered the six furlongs in 1:10.21. Less than a month later, Cairo Prince was stretched to a mile at the Grade 2 Nashua Stakes at Aqueduct. He went away fifth in the field of 12 and gained the lead with five-sixteenths to go. He was in front by five lengths at the eighth pole and won by 2 1/2 lengths ahead of Financial Mogul. Cairo Prince completed the distance in 1:37.59 and returned $10.60 as the 4-1 second choice on horse racing odds. The colt earned $150,000 for owners Namcook Stables, Paul Braverman, Harvey A. Clarke and W. Craig Robertson III. At the 1 1/8-mile Remsen in late November 2013, Honor Code rallied up the rail down the stretch and got his nose on the line ahead of Cairo Prince, who had reached the mile mark in 1:41 with a half-length advantage. Honor Code, who carried 116 pounds, was the 4-5 betting choice on horse racing odds and Cairo Prince, carrying 122, was at 8-5. That close loss was forgotten in Cairo Prince’s first run of 2014 when he won the 1 1/16-mile Grade 2 Holy Bull Stakes on January 25 at Gulfstream Park, which officially stamped Cairo Prince as a leading Kentucky Derby contender. Cairo Prince raced in fourth in the early pace before taking command at the top of the stretch under Saez, opening up on the pack and winning by 5 3/4 lengths. Cairo Prince returned $6.20 to win as the betting favorite in the field of 11 and finished in 1:42.16, missing the track record by just 0.43 seconds. He earned an additional 10 points for the Kentucky Derby leaderboard standings. At the time, it left Cairo Prince second on those standings. Cairo Prince is out of Pioneerof The Nile and Holy Bubbette by Holy Bull, the 1994 Horse of the Year and Hall of Fame thoroughbred with several grade 1 stakes wins, including the Travers, Woodward, Florida Derby and Haskell Invitational. Holy Bull was 12th as the Kentucky Derby odds-on favorite in the 1994 race. Cairo Prince’s sire Pioneerof The Nile is also a multiple grade 1 stakes winner and was second in the 2009 Kentucky Derby and 11th in the Preakness Stakes.